I’ve loved goats ever since I saw that Taylor Swift “I Knew You Were A Goat” video from a few years back. They seem to be some of the most vocal and inquisitive creatures out there. Things like police cruisers ain’t nothing to a goat. 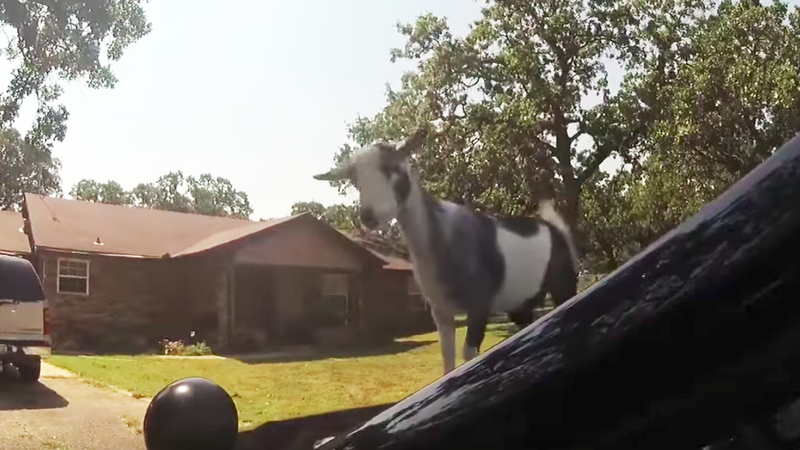 After an officer in Blanchard, Oklahoma, was dispatched to search for a loose pony, his body cam caught footage of a cute goat jumping onto the hood of his squad car, reports KOCO 5 News. The goat belongs to a woman whose property the officer searched for the pony. The Blanchard Police Department said that the goat didn’t do any damage to the car, according to KOCO. Because of course it didn’t. It’s too cute. Look at how happy it is. How daintily it jumps onto the hood. It’s delightful. Why Wouldn&apos;t You Tow Goats Around With Your Lamborghini?